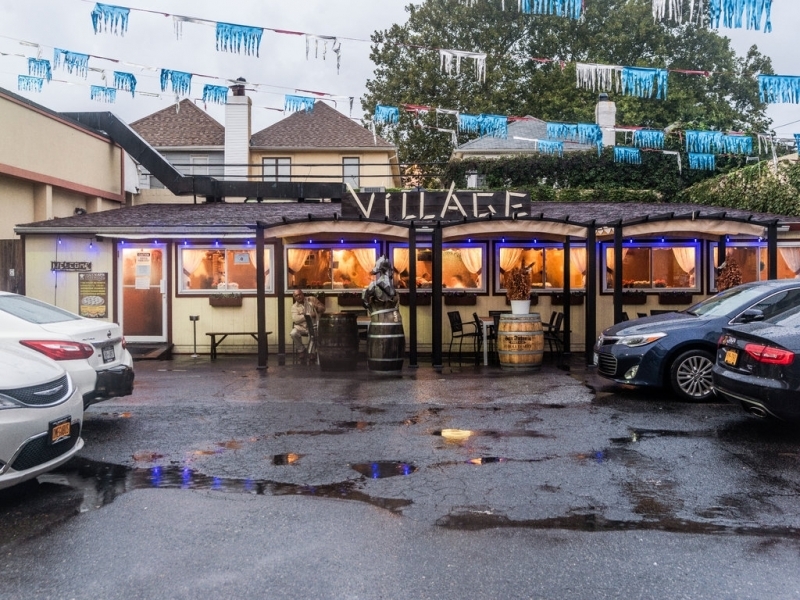 During the five years Village Cafe has been open, I must have driven the length of Coney Island Avenue in Brooklyn a dozen times without noticing it. At best I might have spotted the tiny parking lot in Midwood, with tattered red, blue and silver streamers flapping over its 10 or so spaces, giving it the appearance of the world’s smallest used-car dealership. In the back is a wide, single-story structure that looks like the trailer office where you would sit down to discuss loan options with Marty from financing. But that building is an Azerbaijani restaurant that stands out among the dining outposts of former Soviet republics that stretch north from Brighton Beach, and each time I’ve gone inside I was given not a credit check, but a test of my appetite’s limits. This is not just because almost every platter of food that leaves the kitchen at Village Cafe seems intended to feed an actual village. I run into trouble because there are so many things I want to order and so few things I am willing to leave on the table as the meal winds down. There will never be a time when I go to Village Cafe and decide not to have at least one qutab, if not all three. 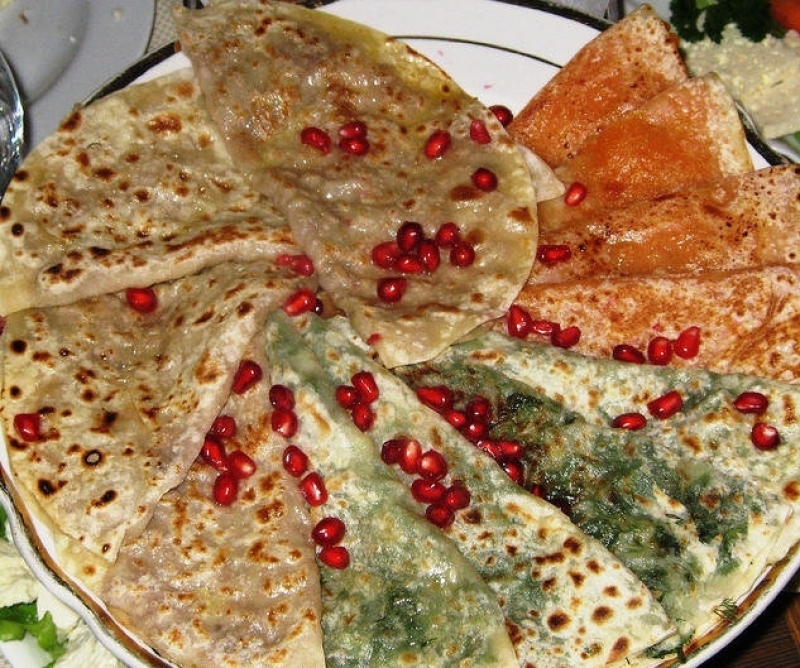 The menu gives the name of this delicate Azerbaijani flatbread, the diameter of a pita but thinner, as kutaby. 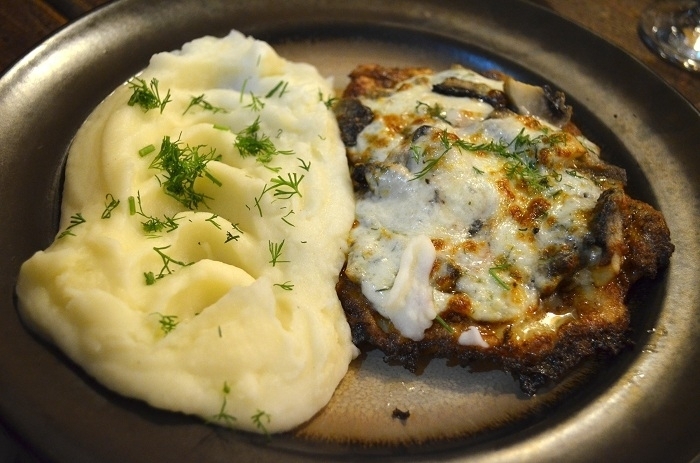 Either way, it is very good when stuffed with minced, quietly spiced chicken or lamb. It is exceptional when filled with greens: spinach, scallions, and dill and cilantro, two fresh herbs that turn up again and again in Azerbaijani cooking. 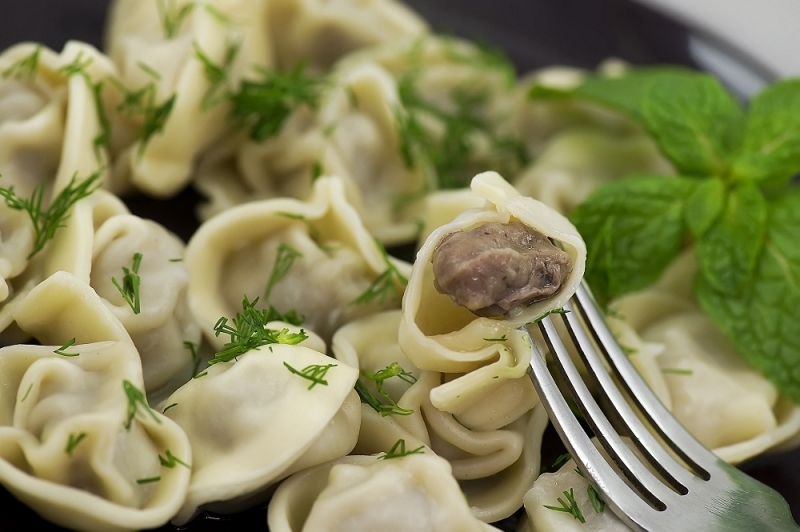 I will always want the crimped dumplings, the size and shape of chicken drumettes, that the English menu calls ravioli and the servers call pelmeni. Filled with chicken or lamb, these dumplings can be boiled, but the urge to ask for them fried is overwhelming, and the fried ones are better dunked in the tomato-pepper sauce that I would call salsa if I were not in an Azerbaijani restaurant. There will be liver on my table, too. Maybe it will be Turkish style, little fried cubes under a tart purple dusting of ground sumac. 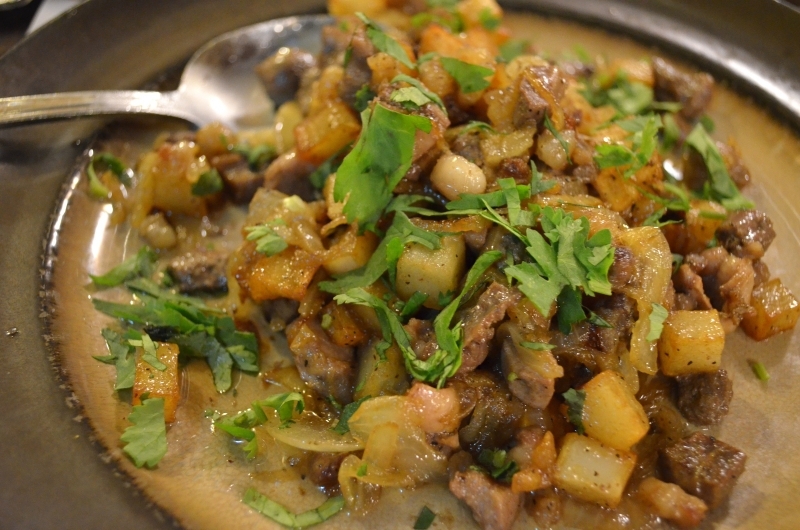 Or the liver may be added to bits of lamb hearts, kidney and testicles, and cooked with onions and potato cubes in a fantastically oily hash called djiz biz. Whether I will eat guru hingal will depend on how far in advance I’ve planned my meal, because it generally has to be ordered a day ahead. 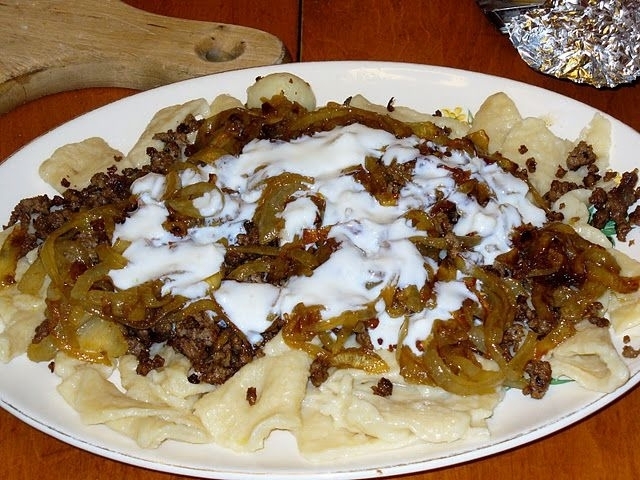 It is a noodle dish: very thin, wide sheets of pasta under a sauce of onions and ground lamb fried in its own fat until it is magnificently crunchy. If you poured chile oil over guru hingal, it would taste Sichuanese; stew the lamb with tomatoes and you could mistake the sauce for Bolognese. But it’s from Azerbaijan, and it’s good with yogurt. And I will have soup, even if nobody else does, because Village Cafe’s kitchen understands how to make it. 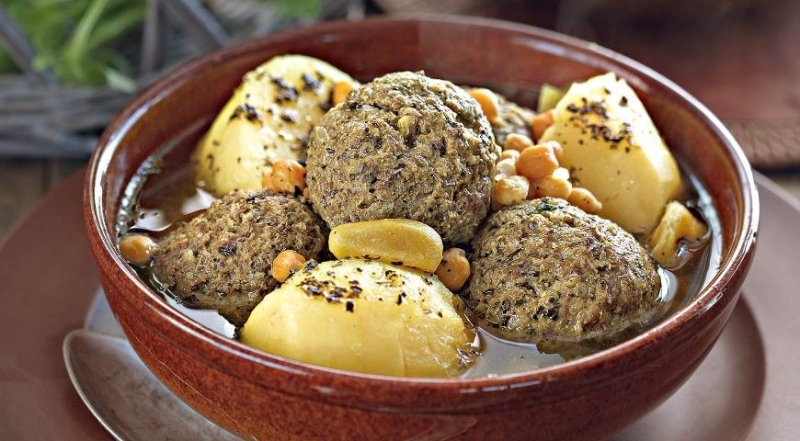 The kufta-bozbash is a strong, well-skimmed lamb broth with chickpeas and a single, tender lamb-rice meatball, as big as an apple. 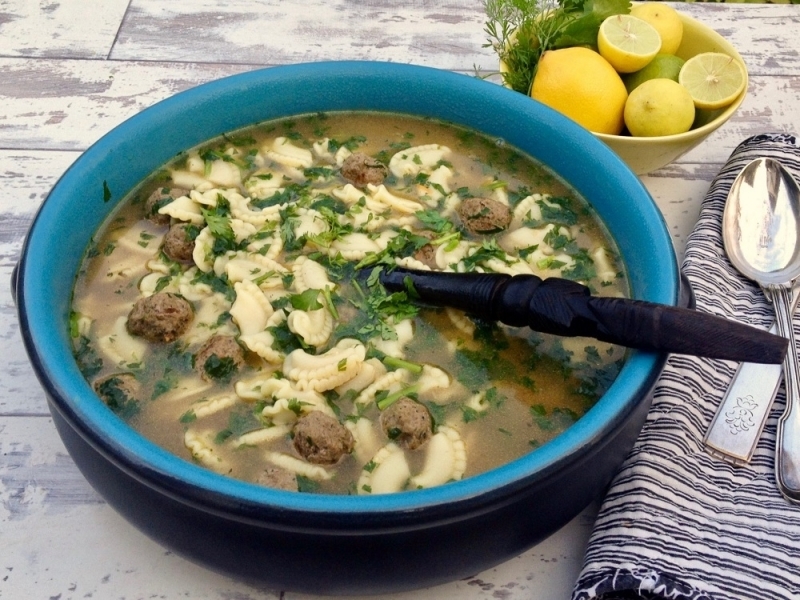 The broth for dushbara soup is similar, but the ballast is provided by miniature lamb dumplings about the size of M&Ms. Cilantro and dried mint are added to both soups at the last minute, and the mint is especially helpful. Village Cafe’s hot borscht, strong and decidedly unvegetarian, outperforms some I’ve had in Brighton Beach. Instead of sour cream, it comes with a spoonful of yogurt. 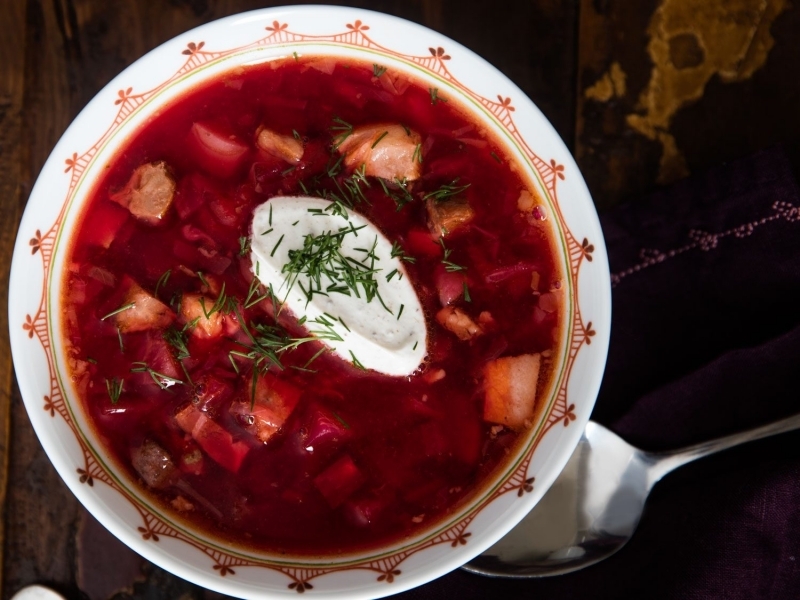 The cuisine of Azerbaijan often echoes those of its neighbors Georgia, Armenia and Iran, but other dishes, like borscht, were hauled down from Eastern Europe in the strong arms of Mother Russia. We can also thank Russia for the insane music videos that play on Village Cafe’s two televisions, typically with the volume off while American pop of the ’80s plays on the sound system. You sit at what appear to be varnished picnic tables with chairs instead of benches. 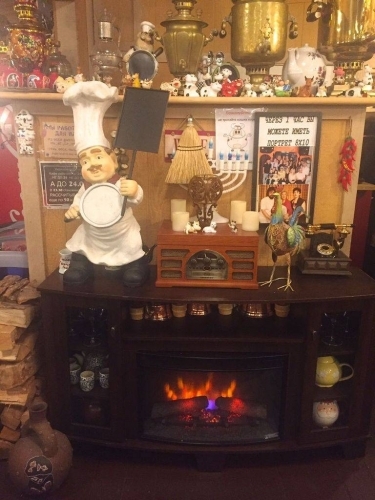 The rest of the décor looks like a Brighton Beach yard sale: a mushroom cookie jar, an embroidered peasant smock, a camouflage cap, a samovar or two, a collection of beaded handbags, several ceramic cows, three statues of fat chefs with toques and mustaches, and two giant forks mounted on the wall. For atmosphere, Village Cafe is roundly beaten by my second-favorite Azerbaijani restaurant in Brooklyn, Old Baku in Kensington. Walk past the awning that says “private club,” past the curtained booths in the front dining room, past the open kitchen where chefs scoop burning coals to keep the fire under the kebabs going strong, and you enter a courtyard from another country. Almost everybody at Old Baku is smoking under the arbor of grape vines that weave around strings of white lights. If you go in the fall, you might be brought a plate of purple grapes, newly picked a few feet away. But Village Cafe gains its edge on Old Baku in the kitchen. 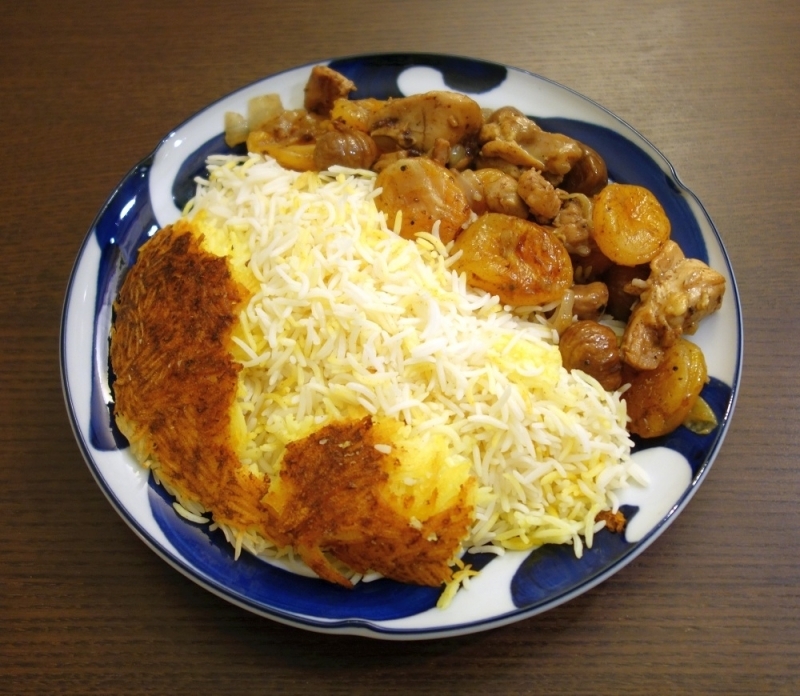 The stewed fruit ladled over saffron rice in its plov, for instance, is a richer and more varied compilation of dried plums, apricots, chestnuts and deeply browned lamb. The salads are brighter, too, if you can get over some of the names. 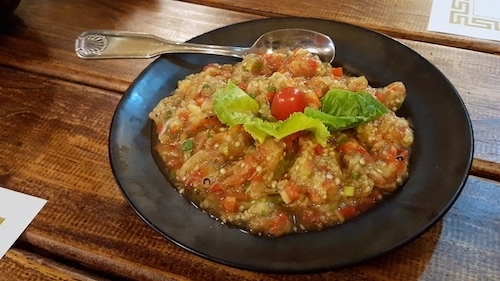 The menu was evidently written by someone with a weakness for poetry, so the salads are called things like “Journey to Baku,” “Winter Fun” and “Unexpected Guests.” The Journey to Baku is worth taking; it’s a sharply seasoned, smoky eggplant mash with peppers and tomatoes. The kidney beans in a traditional lobio salad are creamy, salty and well-oiled under their topping of chopped walnuts and cilantro. But really, the best place to go once all the amenities have been polished off is the kebabs. The quail may be a bit wizened. The grilled testicles with a hint of lemon in their lightly browned surfaces will always be a niche proposition. 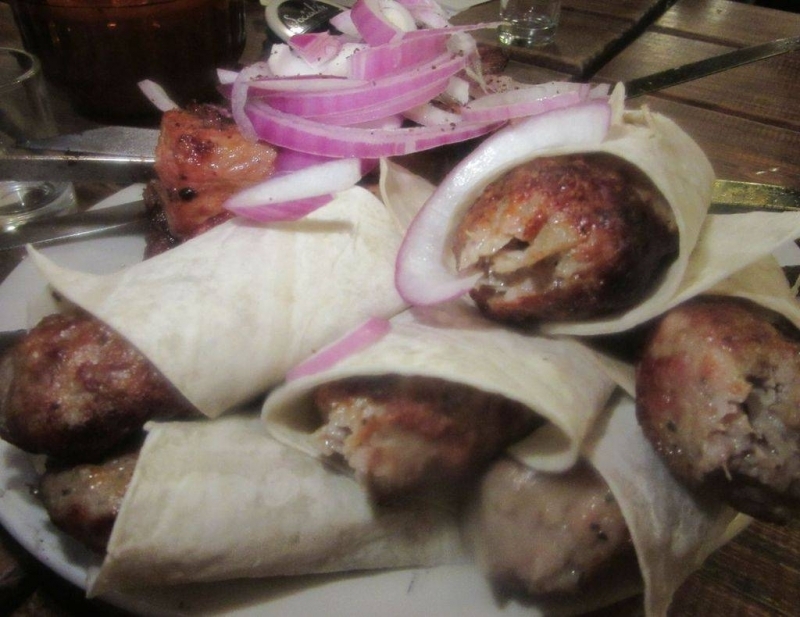 But the lamb ribs, the marinated lamb chops known as chalahac and the flatbread-wrapped Azerbaijani version of kofte called lulya kebabs (made from chicken or lamb) are extremely good. The vegetable skewer choices begin and end with blistered tomatoes and softly collapsing eggplant. Both are worthwhile. So is the side dish called “homemade potatoes,” if there is any room left on the table. 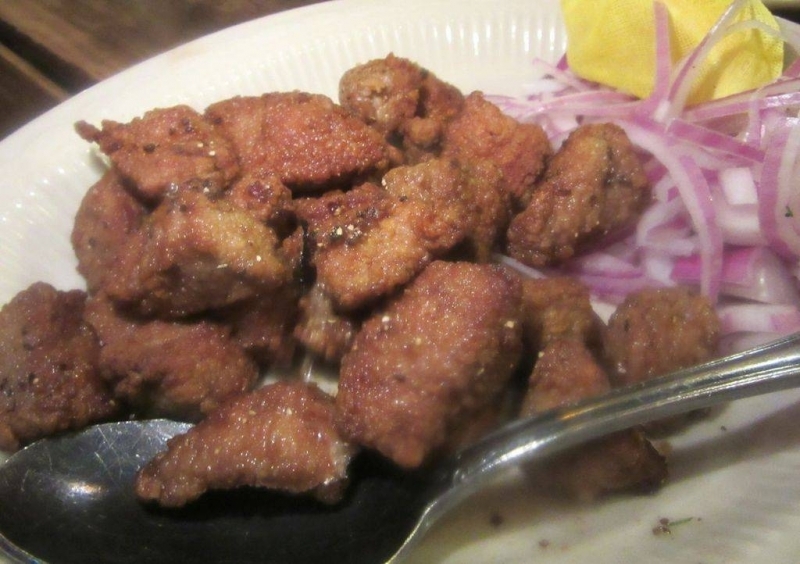 Sliced and fried with onions, they narrowly beat out the pretty good fries. A cup or two of strong dark tea will speed your recovery from this onslaught. Dessert may not. Still, there is something to be said for trying a Napoleon made like baklava and a baklava made like a Napoleon.